What are the health risks posed by mosquitoes? Mosquitoes are considered a vector for disease. 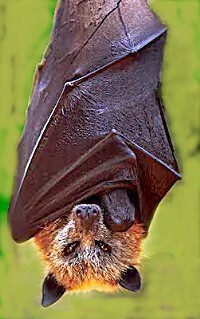 This means they can pick up diseases from other mammals, carry disease, and spread it to humans. In some parts of the world mosquito borne illness is the cause of untold death and suffering. Fortunately here in New York we do not have the climate or the specific types of mosquitoes that transmit such diseases. We do, however, have some mosquito borne illnesses which can still be dangerous. The West Nile Virus is one such disease. It is passed between certain bird species and mosquitoes. Infected mosquitoes can transmit the disease to humans by feeding on their blood. Although most cases of West Nile Virus infection are not very severe or life threatening, the virus can be deadly when it affects very young children, the elderly, or people with compromised immune systems. Tiger Mosquitoes, which are black and white in color and get their name from their striped pattern, are new to the list of the over 20 mosquito species found on Long Island. Originally from Asia where they are detested for their role in spreading Yellow Fever, Tiger Mosquitoes are more aggressive feeders than the others and will bite during the day. According to the estimates of local entomologists, the population of this new invasive Tiger Mosquito species has skyrocketed in recent years. Tiger Mosquito populations increased 220% across Nassau and Suffolk counties between 2010 and 2012. They now account for almost 15% of the local mosquito population, which is nearly double what their population was only a few years ago. Since Tiger Mosquitoes also feed on birds, they are one of the types of mosquitoes that can spread the West Nile Virus. The Chikungunya virus (pronounced chik-en-gun-ye) is the latest addition on our local mosquito problem, This virus was first brought over to the US by tourists returning from the Caribbean. It is expected by the CDC to quickly become established in the United States, just as the West Nile Virus did over a decade ago. Although rarely fatal, the Chikungunya virus causes an assortment of health problems such as headache, muscle pain, joint swelling, or rash. Allergies- although we all react to mosquito bites, some people are severely allergic and may experience symptoms similar to someone with a bee allergy being stung. In order to combat mosquito populations, it is important to understand how mosquitoes reproduce and spread. Mosquitoes breed in standing or “still” water. Mosquitoes can breed in as little as a quarter of an inch of water. The eggs can hatch in 24 hours. The entire life cycle from egg to adult occurs in as little as 7 to 10 days. One single source of still water can produce enough mosquitoes to affect the entire neighborhood and noticeablly increase their population. Call an Exterminator. 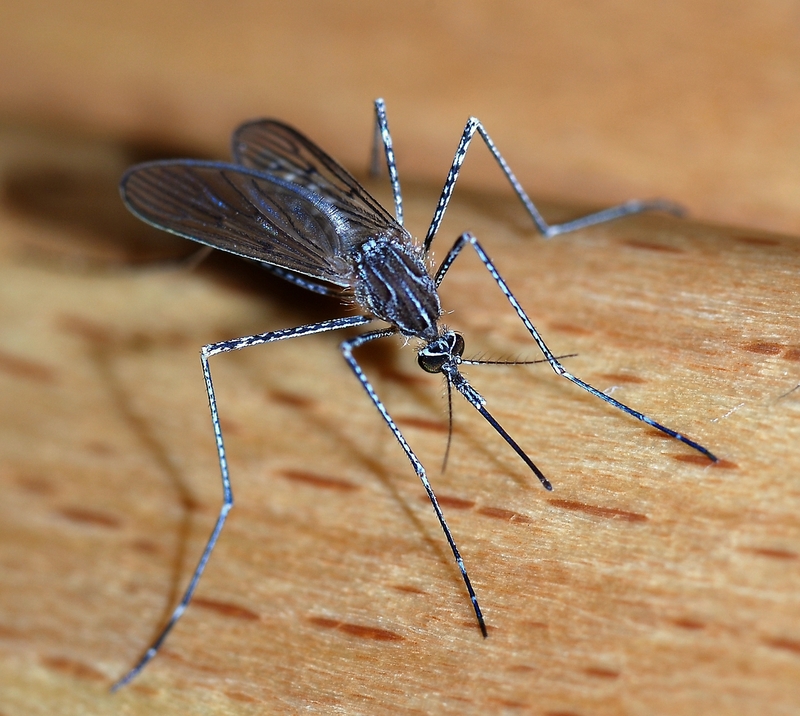 The professionals at Arrow Exterminating are more than happy to tackle even the toughest mosquito problems. We use a cutting edge botanical formula designed to naturally repel mosquitoes from the property without the use of harsh chemicals. Our lawn treatment is based on essential oils and extracts, and although extremely effective against it’s target, the material is not harmful to children and pets so the space can be used again as soon as the treatment is over. Our treatment is guaranteed, and you will see an immediate reduction in mosquitoes after the first visit. This entry was posted in Uncategorized on August 5, 2014 by ArrowBugBlog. 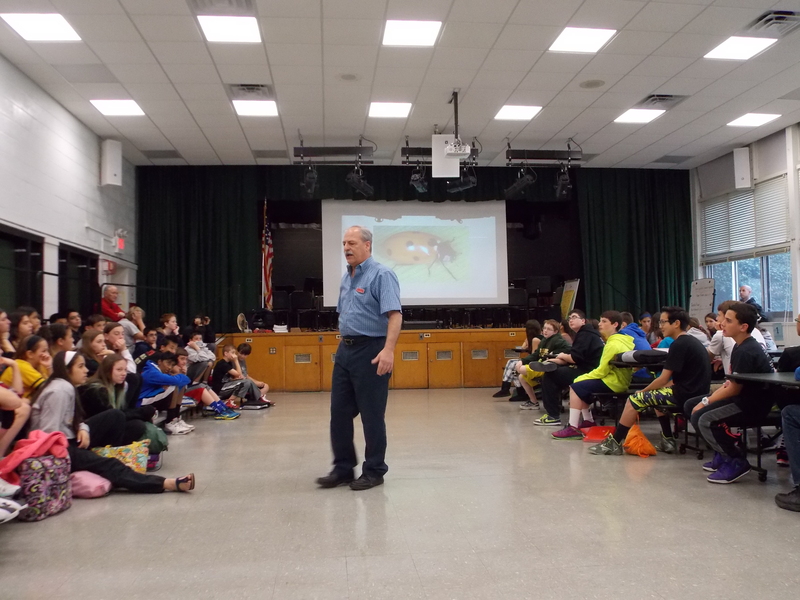 Capitalizing on the natural curiosity of the students, Arrow’s presentation about the world of insects piques their interest with facts and trivia that are at times fascinating, revolting, or even terrifying. One of Arrow’s entomologists on staff, Bern Wendell, knows just how to keep the crowd on the edge of their seats. He is an old hand at this. Bern has been giving this presentation to groups of students for years. As an entomologist, he has a background in science and has dedicated a lot of time to the study of insects. He has developed a fond appreciation for the critters he studied, knows and understands better than most. This has given him a unique perspective on pest control. He skillfully keeps the crowd engaged by encouraging class participation, handing out free prizes, and occasionally shocking the students with the sinister image of an arachnid or a bat flashing across the screen (no insect samples of any kind are actually brought into the room). Beneath all that showmanship lies an important message. No bug is inherently good or bad. An insect that enters your home may be a pest in that situation but the very same insect would be beneficial in a different environment. They all play an important role in the ecosystem and are worthy of our respect and conservation, and they are more interesting than they appear. Even as exterminators who are tasked with killing insects and other nuisance wildlife, we have an obligation to deal with them in the most humane and environmentally friendly way possible. 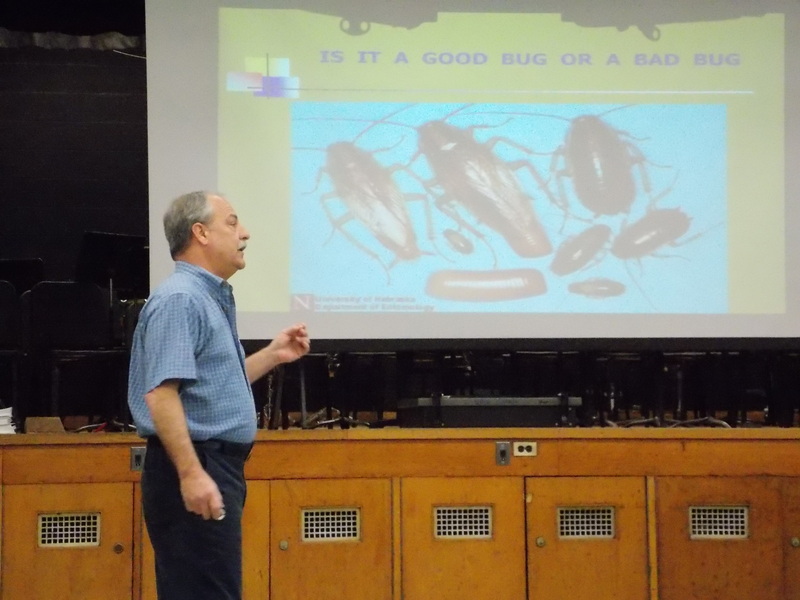 As a company, we want to pass that enthusiasm about bugs and commitment to conservation on to the community in part through these fun presentations. If you or someone you know would like to bring this presentation to a school on Long Island or other youth group, don’t hesitate to let us know! Our presentation is free of charge and includes fun prizes such as bug themed puzzle books, pencils, and even drawstring backpacks. Just call the office of Arrow Exterminating at (516) 593-7770 or (631) 654-0110 and we will be happy to assist you. This entry was posted in Uncategorized on May 22, 2014 by ArrowBugBlog. Why should I care about this behavior? Termites bore through and eat wood. 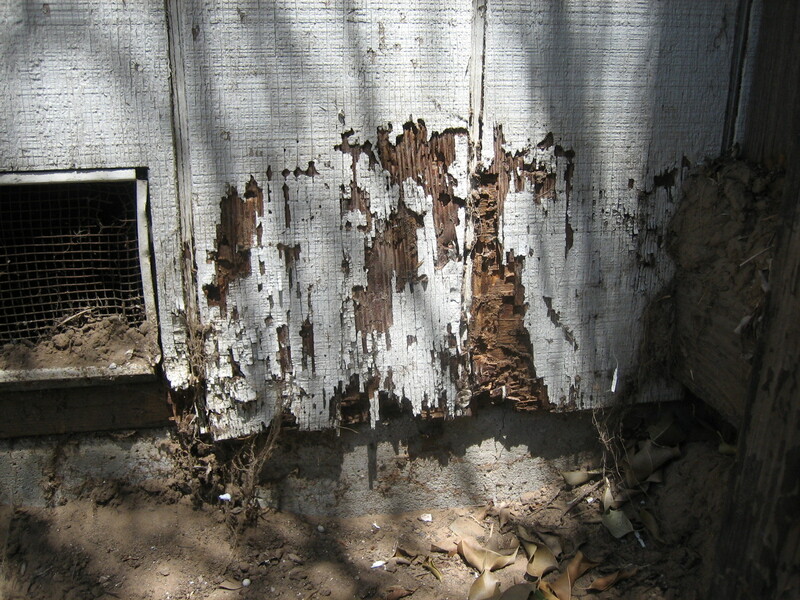 Although this image shows visible damage to a house, often the damage that termites inflict goes undetected. Structural damage caused by termites can make your house unsafe or affect it’s value. The main threats to property that homeowners should watch out for are termites and carpenter ants, because they can eat or chew through the wooden frames of houses and cause serious property damage. Both of these type of insects live in highly organized colonies. Just one of these colonies can consist of thousands or even millions of insects all working in unison towards specific goals as if they were one organism. Within the colony itself insects have specific roles. Each type of insect has a slightly different body type and appearance, for example a worker ant looks and acts different than a soldier. Only a few insects from each colony are able to reproduce. In the springtime, huge numbers of these reproductive ants/termites leave the nest all at once in an attempt to reproduce and establish new colonies of their own. Every spring, as the weather gets warmer, there is a mass exodus of literally thousands of these winged insects swarming around for a short time looking for action. 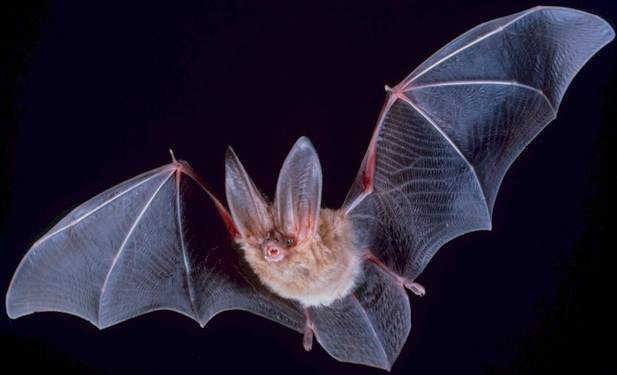 They may be seen in or around the house, commonly trapped in window screens or fluttering around in the air. This is a bad sign, because it means that there is an existing termite colony nearby from which these swarmers are emerging. 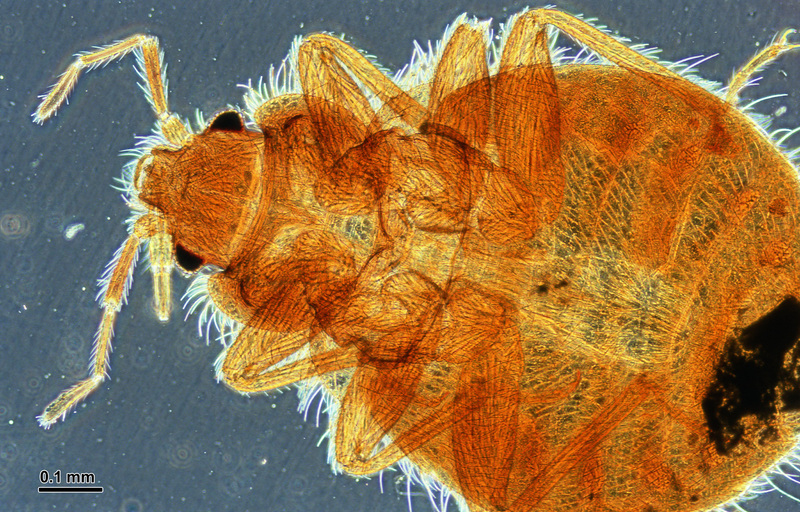 It may be a mixed blessing, however, because usually these types of bugs keep a low profile and it is likely that without the swarmers there would be no other obvious indication of an infestation. How do I know what kind of swarming insect I have? Termites- When termites swarm their wings often become detached. You may see just the wings around the house separated from their bodies. They can be seen anywhere in the house littering the ground, stuck in cobwebs, or often in the boiler room. What do these insects looks like? What does a swarm look like? The ant to the left has a “pinched” body type, bend antennae, and uneven wings. The termite has a body with no segments, straight antennae, and two sets of wings. Click here for more information on citronella ants and how to get rid of them. 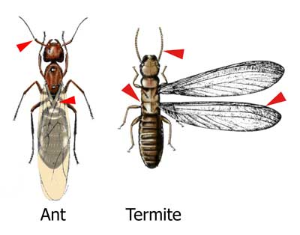 Once I have identified the swarming insects and have confirmed that I have termites or carpenter ants, what steps should I take to get rid of them? First you need to call a licensed exterminator. On Long Island and in the Five Boros of NYC, call Arrow Exterminating to arrange a free inspection. There are several different types of treatment available. Sentricon is highly recommended. The system involves installing bait stations that contain a chemical compound which effects the molting process of termites. Rather than affecting them right away, it is slow acting. This way the termites cannot detect the source of the compound. It also means that the termites carry it back into the colony and feed it to each other before the development inhibitor takes effect, which can take out the reproductive termites and eliminate the whole colony. The Sentricon system is efficient, cost effective, not dangerous to children or pets, and environmentally sound. The technician simply installs the bait stations and then returns periodically to inspect them. This entry was posted in Uncategorized on April 17, 2014 by ArrowBugBlog. Arrow President and motivational sing-along organizer Debby Tappan leads some of the top Arrow management in a melodic reminder for the office staff to get ready for the coming busy season. At around this time every year calls start coming in as dormant pests become active in the spring weather. What better way to prepare than by spontaneously singing about it over lunch. This entry was posted in Uncategorized on April 8, 2014 by ArrowBugBlog. Don’t be alarmed if you see unexpected visitors at your bird feeder this spring. If you have been hearing loud noises emanating from the trees or flocks of brightly colored birds fluttering overhead, don’t worry, you aren’t crazy. 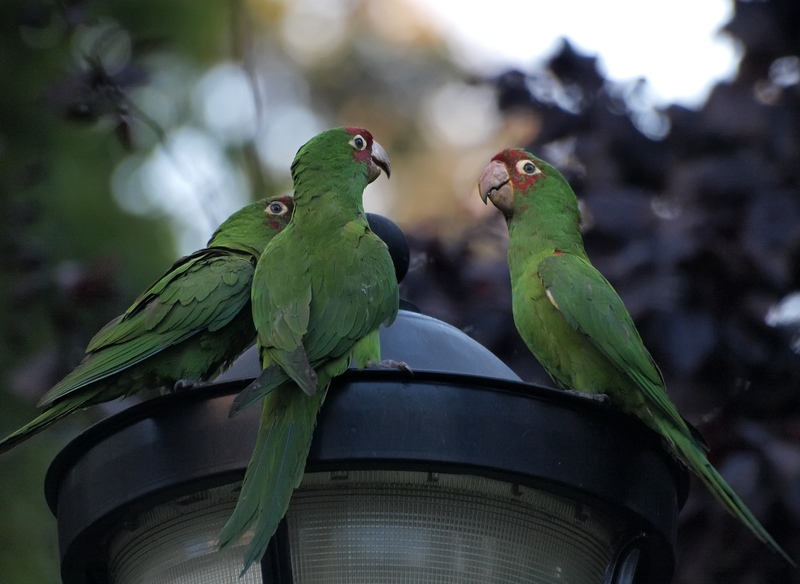 Believe it or not, there are flocks of over a thousand South American parrots roaming wild in NYC and on Long Island. Although the origin of these parrots is the subject of urban legend, the most credible explanation is that in the 1960’s, at the height of the animal trade, a shipment of parrots was released at JFK airport. Experts believe that over time the descendants of the original botched parrot shipment have been supplemented by other released/escaped exotic birds from a variety of species. 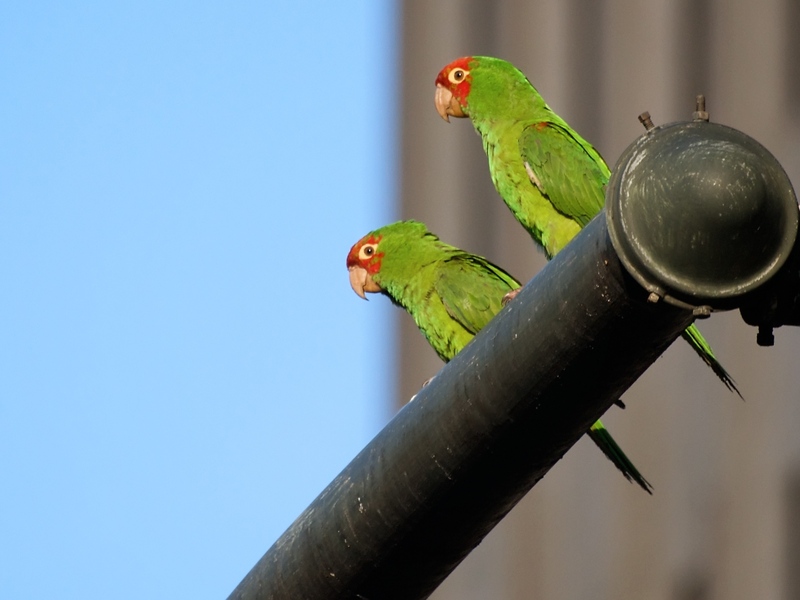 To this day the vast majority of wild parrots in NY are Quaker Parrots, a species native to many South American countries. Incredibly, they have been able to adapt to northern climates despite our harsh winters. This is due to a variety of factors. Of the roughly 350 species of parrots, the Quaker Parrot is the only one that lives in their nest on a daily basis year round. 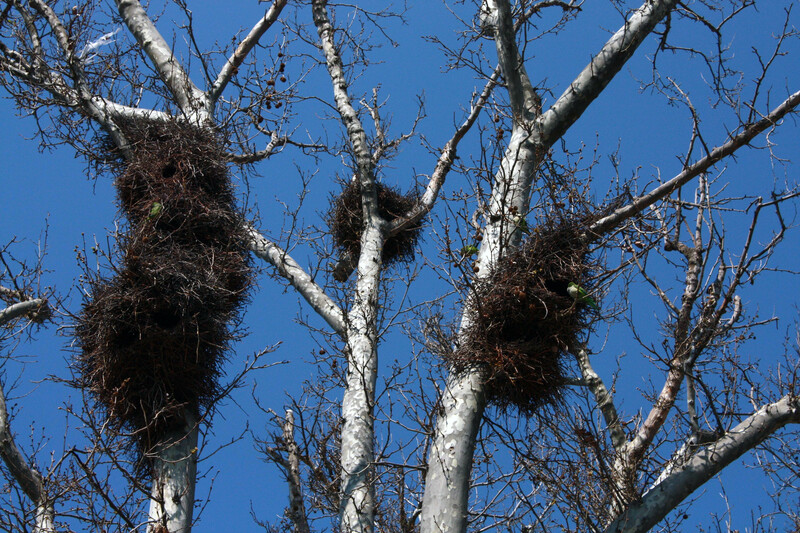 They construct enormous nests that serve as shelters during the harsh winters. Although they can be found in tropical climates, these birds are also native to temperate zones of Argentina that bare similarities to our own environment. They have a varied diet of foods like grasses, seeds, and stems that are widely available in an urban environment. Some experts believe that they may seeks out urban environments because they rely on backyard bird feeders as a way to survive the winter. The pest factor- Although onlookers are often pleasantly surprised to discover wild exotic birds flying around the city, some residents living near the nesting sites are less than thrilled. The Monk Parrot is a highly intelligent bird species with an elaborate repertoire of vocalizations. This not only make them excellent pets, but also warns the flock of predators and enables them to adapt to new environments. Unfortunately, their raucous squawking also makes them less than ideal neighbors. Although initially there was some concern that these parrots would compete with native bird species, it is now clear that they will remain small in number and are not a threat to local ecology. The biggest nuisance posed by these birds is due to their nesting habits. Monk Parrots are unique in their ability to build free standing nests. As they adapt to life in New York, they frequently select telephone poles as places to settle down. The parrots especially favor transistors because of the heat they emit. In the winter, as all of the soggy wet twigs and branches of their nests freeze, the ice conducts an electric current straight through the transistor. This is a dangerous situation that can lead to fires, blackouts, and loss of service. 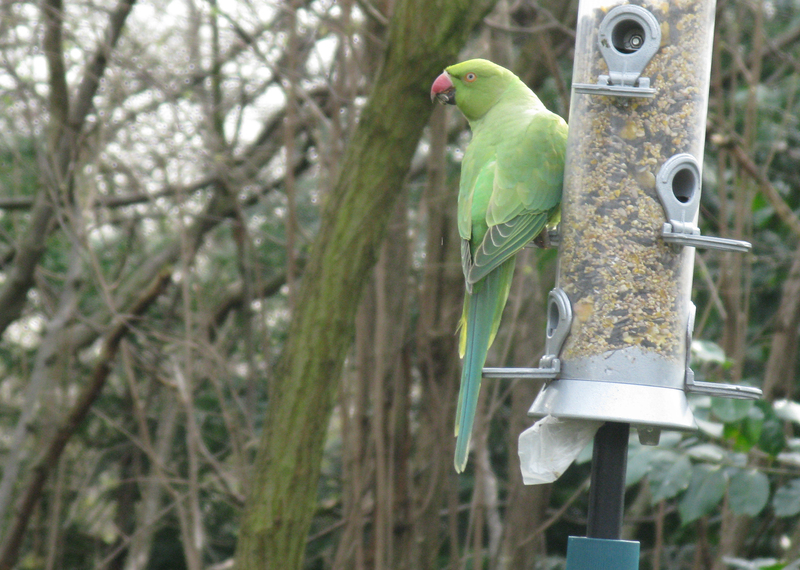 Although the parrots are not a protected species, local electric companies have been accommodating of these birds. Workers have discovered that even if the entire nest is destroyed the parrots will often rebuild in the exact same location rather than moving their homes elsewhere. Instead of seeking to eradicate these birds, Con Edison is looking into methods of securing their phone lines and transistors in a way that will not permit the birds to cause damage. This entry was posted in Uncategorized on March 7, 2014 by ArrowBugBlog.